Various Head Shapes & Sizes - Crayola® Quality! Set includes 5 quality brushes. Older kids can explore different techniques and gain greater control with 5 quality brushes featuring a variety of head shapes and sizes. For multipurpose use with watercolors, tempera poster paint and acrylic paint – even school glue. 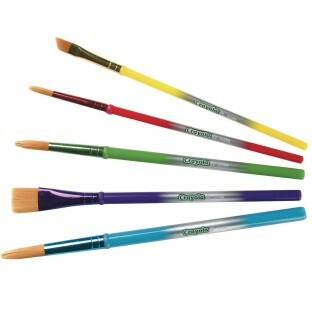 Includes one 15mm flat brush, one 8mm angle brush and 3 round brushes that are 5, 8 and 12mm. I have been an art teacher for four years and these are by far the best variety of pretty good quality brushes you will find for the price. 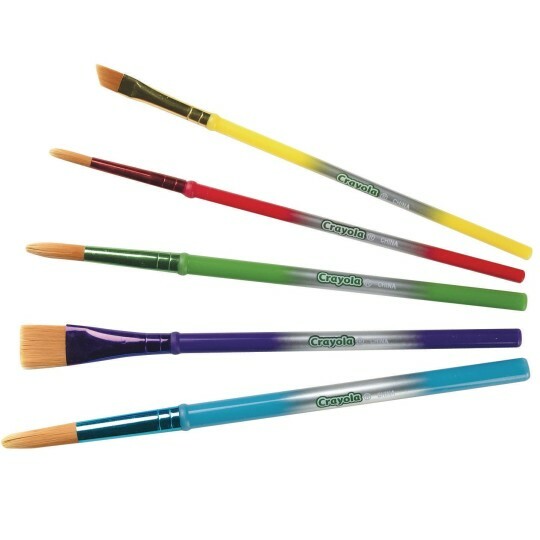 I don't know what the other reviewer is talking about with the brushes all being the same... they are all different sizes- they are the ones you see in the picture. They're obviously not the nicest brushes you can get but for a variety pack for kids they are great! Sturdy Fun Variety of Paint Brushes! Other Reviewer stated brushes were not as advertised but I was inspired to write to say mine were indeed as seen online with a nice variety of 5 different types of brushes. Haven't used them for painting yet but bristles are sturdy and stiff so probably not great for watercolor but seem like they will hold up to tempera acrylic etc. Very happy with the variety and price! These brushes were not as listed. All were the same size and shape. the typical brush you get in your watercolor sets. Might have to ask for a refund on this one. I could have bought at the dollar store.